Figure 1. American Museum of Natural History, Manhattan. Courtesy https://commons.wikimedia.org/wiki/ File%3AAmerican_Museum_Natural_History_3792476001_6cab532900.jpg. By Smart Destinations (http://www. ickr.com/photos/gocardusa/3792476001/) [CC BY-SA 2.0 (http://creativecommons.org/licenses/by-sa/2.0)], via Wikimedia Commons from Wikimedia Commons. As we walked down Broadway toward 81st Street, it began to rain, not heavily enough for us to give up our quest and head home, but enough to test our resolve. With some trepidation, we were on our way to see the Cultural Halls at the American Museum of Natural History (AMNH). Neither of us had visited them in many years. Susan wanted to see them now, her interest piqued by reading about Franz Boas’ work on the exhibits of the material cultures of Northwest Coast Indians (now known as First Nations) and Canadian Eskimos (now known as Inuit). Emily has lived in New York City for almost two decades and been to AMNH a number of times but only to see mammals, fish, birds and dinosaurs with visiting relatives and friends. It had never occurred to her to take her visitors to the Cultural Halls; she didn’t even know if they were still there. Anthropology colleagues we’d had lunch with that day weren’t sure the Halls were still up either. They had never seen them or, like us, had not explored them in many years. We wondered why not. It began to feel as if we had been avoiding them. We knew from our previous trips to the Natural History Halls that the museum took immense care with the accurate display of some of the animals, plants and other living organisms from the 33 million items in the museum’s collection. Craftsmen built scaffolds for animals upon their actual skeletons, modeling muscles and other tissues, over which they stretched the real skin of specimens (elephant or eagle, whale or beaver). 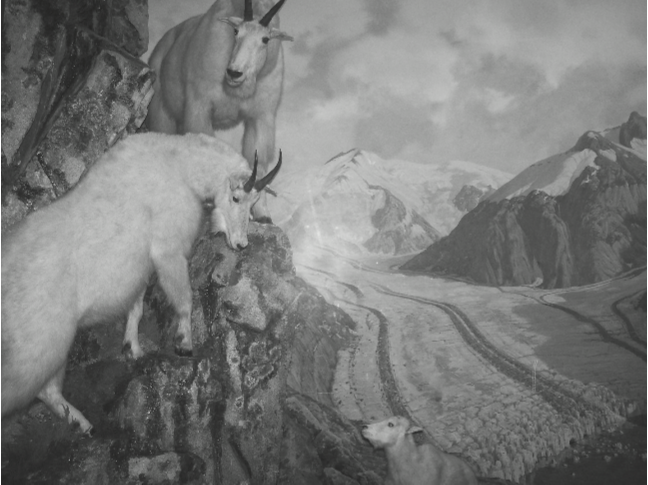 Artists, taxidermists and others translated the best descriptions of the original natural habitats into dioramas with painted landscapes for backdrops to settings that included models of plants, flowers, trees and grasses alongside cohabiting animals. Verisimilitude was the goal. The museum intended for all essential participants in the local environment to be represented in a diorama because, in an early version of ecological thinking, each participant fulfilled a function that was necessary to the well-being of all others. Every diorama was stable, calm, orderly and unchanging . We gather this ahistorical approach is no longer considered valid, even for the Natural History Halls, but feared that a similar logic was still at work in the Cultural Halls where we were headed. Unlike Holden Caulfield, we did not relish the prospect that everything in those spaces had stayed the same. Figure 2. Diorama at the American Museum of Natural History. https://upload.wikimedia.org/wikipedia/commons/c/ c0/2~Diorama~AMNH~11-29-08.jpg. By WiKiRaW31 (Own work) [Public domain], via Wikimedia Commons. The floor plan handed out at the museum identifies eight Cultural Halls: the Hall of African Peoples, the Hall of Mexico and Central America, the Hall of South American Peoples, the Stout Hall of Asian Peoples, the Hall of Northwest Coast Indians, the Margaret Mead Hall of Pacific Peoples, the Hall of Plains Indians and the Hall of Eastern Woodlands Indians. The Halls date from the 1960s and 1970s, with three exceptions. The Hall of Northwest Coast Indians was installed in 1900, when Franz Boas worked at AMNH. The Hall of Pacific Peoples, designed by Margaret Mead in 1970, was reinstalled in 1984, six years after she died, to include a video about her and cases displaying gifts she received from Pacific Islanders, along with her famous cape and walking stick. The newest, the Hall of Asian peoples, was installed in 1989. Once we realized that the Cultural Halls were indeed still there, we wondered whether we would find them in their original condition, unreconstructed. If they had been renovated, we wondered to what effect. As it turned out, we could not see evidence of updating . Ranging in age from 27 to 116 years old, the Cultural Halls must be among the oldest, if not the oldest, permanent exhibitions in the museum. In the politically innocent language of the wall-mounted exhibit labels, we were told that six of the Cultural Halls reconstruct the life ways and adaptions of the world’s diverse peoples as they were before European contact. (The Latin American Halls focus on more ancient pre-Columbian cultures). Of course—and this is what we found most riveting—these six halls in their unreconstructed state also re-enact the colonial project of early 20th century museum practices and cultural anthropology. In most of the cultural dioramas and display cases, European science collects, classifies and exhibits the materials, figures and activities of “less advanced” non-European peoples around the world during the period of contact. But it does so as if they were anchored in some prior pristine state, what anthropologists call the “ethnographic present.” The exhibits portray peoples who had been in direct or indirect contact with Euro-Americans for many decades, sometimes centuries, and then erase the evidence of contact and its profoundly transformative effects. Every “culture” on display is, in effect, a suppressed history of protracted encounters between colonizers and the peoples being colonized . We chose three of the Halls to walk through, and we give you here a few examples of what we saw in each one and what they led us to think about. Neither of us is expert in the anthropology of museums or expeditions, which are burgeoning fields; we draw on that literature in our observations here. As anthropologists, we are invested in how our discipline is represented in AMNH along with the cultures on display, but we are writing more as citizens than as scholars. We would like to start a conversation with interested readers about the Halls, what they represent and how they might be redesigned, if only in our dreams. Figure 3. Hall of African Peoples. American Museum of Natural History. By Chensiyuan at the English language Wikipedia, CC BY-SA 3.0, https://commons.wikimedia.org/w/index.php?curid=6700002. The Hall of African Peoples covers the entire continent by dividing it into four environments (grasslands, deserts, forests and river regions) and sampling the “lifestyles and customs—many of them disappearing—of peoples living in [them].” Opened in 1968, the Hall is filled with ecological and functionalist accounts of the artifacts, practices and intercultural relations on display. 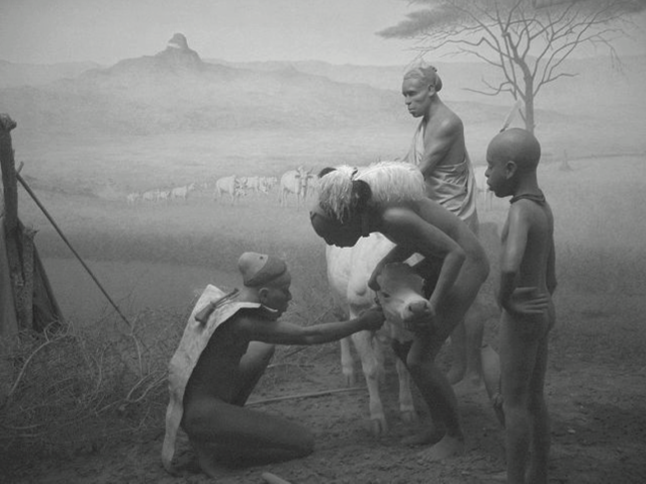 A diorama of a Mbuti family hunting and gathering in the Ituri forest exemplifies the kind of romanticized realism such accounts yield. The label below places the family in a zone between nature and culture: “The Mbuti pygmies [as they were once known] of the Ituri forest typify both physical and sociological adaptation. Their small stature (4’6” maximum) and light skin color help them move about easily and unnoticed, their economy requires few tools, with no animal or plant raising.” When nature recedes from view, social functionalism comes forward. We learn, for example, that “mutual raiding” between Masai herders and Kikuyu farmers in the East African grasslands “served as a safety valve, allowing each side to express its opposition and so reinforce its values without resorting to open warfare.” Together the displays present Africa as an ensemble of human adaptions to natural and social environments largely uncompromised by Euro-American slave-trading and colonial incursions. While there are a few historical glimpses of colonial interactions, the dominant logic guiding the exhibits in the Hall of African Peoples resembles the early ecological thinking of the Natural History Halls. “Func- tionalism” was well known to us from the history of anthropology as it was practiced in the 1930s to the 1960s. Anthropologists of that time saw the societies they visited in Africa, India, Asia or South America, for example, as functioning wholes. Each custom or belief had a role to play in maintaining orderly conduct, preserving knowledge, passing authority along the generations and ensuring the reproduction of the culture. Even conflict could be understood as a way to maintain the cohesion of societies over time. Since we had both been active ethnographers in the subsequent decades — the 1970s to the present — we also knew a lot about the shortcomings of functionalism. Functionalism gave the impression that most non-Western cultures were outside of history, unaffected by forces such as colonialism and capitalism, migration, conflict and war, and non-European trade networks. Functionalism decided beforehand what the importance of cultural practices was and seldom inquired of participants what they thought their practices were all about. Functionalism also presumed that cultures would persist unchanged forever were it not for European contact, signs of which were suppressed for the sake of creating the illusion of static traditional cultures. The Hall of Northwest Coast Indians evoked an even earlier era of museum collecting and display, from the turn of the 20th century. The Hall is divided into alcoves devoted to the ritual and domestic paraphernalia of eight Northwest Coast “traditional cultures” and separated by floor-to-ceiling totem poles. At the far end are several full-size “life group” exhibits depicting Northwest Coast peoples preparing smoked salmon and making ritual goods, a potlatch scene, and supernatural spirits and animals. The Hall is frequently full of visitors, not because it is a destination, but because the entrance to the IMAX theater is located at the far end. IMAX patrons have to pass through the Hall, but they rarely pause to look at the displays, which are dimly lit, unengaging and obviously dated. Aside from the cobwebby, musty feel of the place, the labels are opaque and the tribal names reflect colonial, not current, naming practices. The peoples labeled “Kwakiutl” and “Bella Coola,” for example, are known now by the names that they give themselves, the “Kwakwaka’wakw” and the “Nuxalk” . What’s odd is that the Northwest Coast peoples are properly designated on the AMNH Web page about the Hall and in the digital archives, but not in the Hall itself. What was most innovative about the Northwest Coast Hall when it was installed is now completely lost on visitors. The original anthropology curator, Franz Boas, opposed the dominant museum practice of the time, which arranged types of objects in groups ranging from simple to complex — irrespective of their origin — in a way that implicitly argued for the superiority of Western civilization. Instead of this evolutionary scheme, Boas insisted on the cultural grouping of Northwest Coast masks, capes, blankets, tools and sculptures in order to persuade viewers to understand and appreciate each culture on its own terms. He wanted the Hall to assert that “our ideas and conceptions are true only insofar as our civilization goes.” At the same time Boas’ work asserted this cultural relativism, however, it also claimed the authority of science, of Euro-American knowledge-making practices, over local knowledge practices. Boas was a scrupulous researcher and worked closely for many years with an indigenous collaborator, George Hunt. But in the end, speaking on behalf of science, it was Boas who divided, named and interpreted the Northwest Coast cultural materials. On the one hand, the Hall invites visitors to understand all cultures on their own terms. On the other, it invites the public to share in the authority of science as they view passive, silent objects from faraway places . Figure 4. “Council House of the Creek Indians.” Photo by Boris Dzhingarov. https://commons.wikimedia.org/ wiki/File:American_Museum_of_Natural_History_in_Manhattan,_New_York_City,_United_States_of_America_ (9860189613).jpg. An individual could be considered for membership by applying, by having a suitable dream, or by replacing a deceased relative who had been a candidate, but the leaders of the society decide whether or not to accept him as a candidate for admission. Before and during the lengthy and dramatic initiation ceremony of the Midewiwin, the candidate is taught its myths, rituals, songs, and remedies. The candidate pays for each bit of such knowledge because the Indians believe that the power of each is diminished if there is no payment. Eventually members acquire a knowledge of a large number of remedies, both magical and practical, together with the appropriate songs and sacred formulas. Most of these remedies were handed down from generation to generation and presumably had their origins in dream revelations. Next to this text are several items used in Midewiwin healing, and the adjacent case features a miniature diorama of a scene with people going through the society’s initiation ceremony. Looking at these cases made us uneasy. We had both assigned Eric Wolf’s classic Europe and the People without History so often we could practically recite by heart Wolf’s discussion of the Midewiwin. He understood “Midewiwin culture” to be the outcome of the breakdown of social organization that followed the establishment of the fur trade in this region. By introducing relationships based on monetary transactions, the fur trade had upset social ranking arrangements based on kinship obligations. What looked like an arcane and esoteric ritual to determine group membership was actually a sign of a society in transformation as a result of Europeans trading for furs. Indeed, in the AMNH case next to the one depicting the Midewiwin ceremony, there are four decorated otter pelts. But no explanation connects these to the fur trade or any other process unfolding in time. As it was often in so many of the cultural displays, history was present in the objects but absent from the interpretive text . The disciplines of anthropology and museum studies have moved on, as have many museums. We think AMNH should move on, too. The institution continues to work within an ahistorical salvage paradigm of so-called disappearing primitive cultures that both obscures its colonial history and reinscribes it for five million visitors each year. Half of them are children. If the museum’s top priority is public education, it needs to change this message. Eric Wolf’s effort to place “people without history” in history is now part and parcel of most ethnographic museum practice. Some new exhibits specifically foreground the colonial context in which their ethnographic collections came to be, educating visitors about how earlier museums, collectors and anthropologists collaborated in the transformation of the cultures they represented. This is particularly visible in temporary exhibitions such the Tate Britain’s recent “Artist and Empire,” which juxtaposed the work of well-known British artists depicting diverse imperial scenes with the works of unnamed colonial subjects drawn from the ethnographic collections of other museums. “Their presence,” one reviewer noted, “next to the culturally consecrated works of British art prompts us to question notions of authority, hierarchy and status on which the prestige of the Tate and similar museums depends” . The Rautenstrauch-Joest Museum in Cologne builds this kind of reflexivity and historicism into its permanent display. Current practice for ethnographic museums is to renarrate displayed objects so that the specific historical contexts of the peoples who made them are part of the story. Always, the peoples were already caught in often long-running histories of contact with Europeans and North Americans, but usually, also, their cultures were the outcome of deeper histories of contact with both neighboring and far-flung cultures. There is no such thing as “people without history,” and the notion that one could see anything resembling a “precontact culture” on display in a museum is untenable. Native American activists have provided trenchant analyses of the broader historical context of colonialism in North America, which many hope will become part of the “Second Museum Age.” Amy Lonetree’s analysis is particularly illuminating about the Mille Lacs Indian Museum in Minnesota, the Smithsonian’s National Museum of the American Indian in Washington, DC, and the Ziibiwing Center of Anishinabe Culture and Lifeways in Michigan . Virtually all anthropological museums in Australia, New Zealand and Canada find ways to share authority with representatives from nondisappearing “source communities.” Some metropolitan museums have repatriated objects and bones to descendant communities, which have established their own museums, such as the Canadian Northwest Coast peoples’ U’mista Cultural Centre and the Kwagiulth Museum . Other museums with large ethnographic collections are redesigning their exhibits in collaboration with descendants of the peoples whose objects are stored and on display. For example, the University of British Columbia Museum of Anthropology recently redesigned its “visible storage” area in collaboration with indigenous communities, in ways that reflect their priorities. The hierarchy between viewer and viewed is thus challenged and transformed, and visitors find themselves in a contact zone, participating in a dialogue with ongoing peoples who speak for themselves, in their own voices, about their life ways and about objects the museum has acquired . In New York City, the National Museum of the American Indian is the site of many collaborations with Native American and other indigenous peoples. And in 2009, New York University’s Grey Gallery hosted a collaborative exhibition of Aboriginal acrylic paintings. The exhibit, “Icons of the Desert,” displayed works owned by an American collector, but as a result of much negotiation, it scrupulously followed Pintupi protocols about displaying the paintings and in the process became as much about indigenous survival and recognition as it was about art . 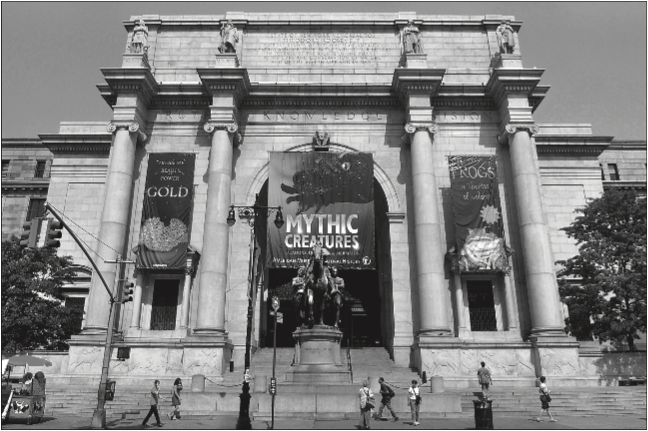 We know of several projects related to AMNH that reflect these sorts of new museum practices. One was organized by AMNH itself. “Chiefly Feasts: the Enduring Kwakiutl Potlatch” was a temporary and touring exhibit in the early 1990s that was cocurated by Aldona Jonaitis of AMNH and Gloria Cranmer Webster, a Kwakwak’wakw chief and anthropologist. The exhibit compared contemporary potlatch practices with practices at the turn of the 20th century when Franz Boas and George Hunt assembled the objects on display. It also described Canadian missionary and government efforts to abolish the potlatch between 1880 and 1960, thus narrating the resilience of Kwakwak’wakw culture rather than its demise. The exhibit opened with a potlatch-style feast, which descendants of the Boas family, the Hunt family and other Kwakwak’wakw artists and elders attended, and included films, lectures, dances, carving demonstrations and a two day conference. While fraught at times and by no means free of the legacy of earlier museum practices, “Chiefly Feasts” demonstrated the museum’s ability to engage in new practices . Another project supported by AMNH is the annual series of symposia and films, many involving indigenous filmmakers, in recognition of Margaret Mead’s long history with the museum. In contrast to the permanent exhibitions, The Margaret Mead Film Festival provides a decolonizing force. Finally, we call attention to a project that indicates the rich resources outside the museum but within New York City that could be brought to bear on updating the Cultural Halls. 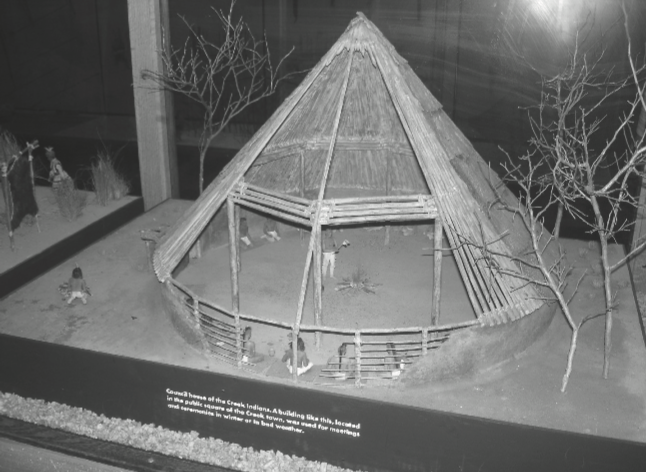 A 2012 class in New York University’s Museum Studies Program was charged to “rethink the Northwest Coast Indian Hall at the American Museum of Natural History.” The group researched, evaluated and proposed numerous constructive ways to redesign the Hall and published its findings as a blog, which is brimming with free and noteworthy assessments and suggestions, such as the proposed display of Northwest Coast/Chinese trade . We understand that projects and consultations for updating the Cultural Halls are under way now at AMNH. A proposal is circulating that would substantially reimagine the Asia Wing — the Hall of Asian Mammals as well as the Hall of Asian Peoples. Another very small but equally promising project introduces “telepresence robots” in the Hall of Northwest Coast Indians. The robots, consisting of screens mounted on wheeled poles, beam “tour guides” into the hall from the Haida Gwaii Museum 3,000 miles away in Canada. The guides, who are indigenous intern curators, talk to visitors about the items on display, bringing them to life with local knowledge and personal stories. We look forward to talking to museum curators about these and other ideas they have for a second installment of this essay. 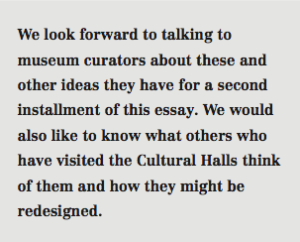 We would also like to know what others who have visited the Cultural Halls think of them and how they might be redesigned . Meanwhile, here are a few parting ideas about how the museum might improve its educational mission. First and foremost, we suggest hiring indigenous curators and adding indigenous experts to the institution’s Board of Trustees. Those of us who teach a variety of high school and college subjects in the New York City area could organize tours of the Cultural Halls for our students, or send them there to do participant-observation and interview visitors, making the museum itself, not “primitive cultures,” the exhibit. We could take a page from the NYU blog about rethinking the Hall of Northwest Coast Indians and imagine new displays and exhibits for the other Halls. The museum says many of the cultures on display no longer exist. Really? Perhaps the museum has mistaken cultural change for cultural death . Even in those cases where it seems the museum is right, it might create a contact zone, a dialogue, between itself and the peoples whose ancestors are on display. Or how about mounting “Chiefly Feasts II,” this time with more of an eye toward fundraising? Redesigning the Cultural Halls will be expensive. So in addition to imagining major fundraising events, we should envision new exhibits that will attract visitors and donors, at the same time they update the educational messages of the Halls. There would be an outcry if visitors walked into AMNH today and saw “Man among the Primates,” a large wall chart on display in the museum until 1961 that visually suggested the superiority of the “white race.” We think the museum still represents the superiority of Euro-American culture over many of the non-Euro-American cultures on display in the Cultural Halls by depicting them as if they were “disappearing” rather than ongoing, and by asserting, in effect, that “we” have the exclusive right to represent “them.” We think changing this message should be as high a priority as the new $350-million Richard Gilder Center for Science, Education and Innovation, which is next on the AMNH agenda. Thanks to Kathy Chetkovich for editorial advice and to Anya Urcuyo for help with references. We are grateful to Jane Anderson, James Clifford, Richard Cone, Haidy Geismar, Donna Haraway, Rusten Hogness, Fred Myers, Hugh Raffes and Sharon Simpson for giving us their insights. We thank Maria Vesperi for her editorial guidance and support. 1. Donna Haraway, “Teddy Bear Patriarchy: Taxidermy in the Garden of Eden, New York City, 1908–1936,” Social Text, no. 11 (1984): 20. 2. As we learned later, the renovations that have been done preserve the original paradigm of the Hall’s design, which explains why they are hard for untrained eyes to see. 3. J.A. Boon, “Why Museums Make Me Sad,” in Exhibiting Cultures; the Poetics and Politics of Museum Display, ed. Ivan Karp and Steven Lavine (Washington, DC: Smithsonian Books, 2012), 255. 4. Using names that communities have chosen from their own languages is an important part of recognizing that indigenous peoples are contemporary peoples with sovereign rights. 5. For further elaboration of these points, see Haidy Geismar, “Rethinking the North West Coast Indian Hall at the American Museum of Natural History,” http://blogs.nyu.edu/blogs/hg26/rethinkingamnh/; Joseph Masco, “Competitive Displays: Negotiating Genealogical Rights to the Potlatch at the American Museum of Natural History,” American Anthropologist 98, no. 4 (1996): 837; Barbara Kirshenblatt-Gimblett, “Objects of Ethnography,” in Karp and Lavine, Exhibiting Cultures; Franz Boas, “Some Principles of Museum Administration,” Science 25, no. 650 (1907): 921; Ira Jacknis, “Franz Boas and Exhibits,” in Objects and Others: Essays on Museums and Material Culture, ed. George W Stocking. (Madison: University of Wisconsin Press,1988), 75. 6. Another unacknowledged history in these display cases is the contemporary Anishinabe understanding of the legacy of the Midewiwin as recorded in an epic prophecy called the Seven Fires. The prophecy warned of a devastating invasion leading to a widespread migration and followed by a period of secrecy during which ceremonies would have to be held underground. The world is now in the Seventh Fire, a period of Anishinabe resurgence. Leanne Simpson, Dancing on Our Turtle’s Back. (Winnipeg: Arbeiter Ring, 2015). 7. Martin Oldham, “Tate Britain Finally Gets Round to Tackling the Subject of Empire,” Apollo: The International Art Magazine, December 2015. See also Nicholas Thomas, “We Need Ethnographic Museums Today Whatever You Think of Their History,” Apollo: The International Art Magazine, March 2016. 8. Ruth Phillips, “Re-Placing Objects: Historical Practices for the Second Museum Age,” Canadian Historical Review 86, no. 1 (2005): 83; Amy Lonetree, Decolonizing Museums: Representing Native America in National and Tribal Museums (Chapel Hill: The University of North Carolina Press, 2012). 9. Repatriations in the United States are governed by the 1990 Native American Graves Protection and Repatriation Act (NAGPRA), which is an unfunded mandate. For a discussion of three repatriation cases involving AMNH, see Martha Graham and Nell Murphy, “NAGPRA at 20: Museum Collections and Reconnections,” Museum Anthropology 33, no. 2 (2010): 105. 10. Jane Anderson’s Local Contexts labeling system is an exemplary innovation that enables dialogue and collaboration. See Jane Anderson, Michael Ashley and Kim Christen Withey, “Local Contexts: Traditional Knowledge Labels.” http:// www.localcontexts.org/. 11. James Clifford, “Four Northwest Coast Museums” and “Museums as Contact Zones,” in Routes: Travel and Translation in the Late 20th Century (Cambridge, MA: Harvard University Press, 1997); Fred Myers, “Disturbances in the Field: Exhibiting Aboriginal Art in the US,” Journal of Sociology 49, no. 2–3 (2013): 151. 13. Faye Ginsburg, “Screen Memories: Resignifying the Traditional in Indigenous Media,” in Media Worlds: Anthropology on New Terrain, ed. Faye Ginsburg, Lila Abu-Lughod, and Brian Larkin (Berkeley: University of California Press, 2002); Haidy Geismar, “Rethinking the North West Coast Indian Hall at the American Museum of Natural History,” 2012. http://blogs.nyu.edu/blogs/hg26/rethinkingamnh/; http://blogs.nyu.edu/blogs/hg26/rethinkingamnh/2012/05/chinese_coins_and_ the_tlingit_1.html. 14. Please send responses to anthronow@me.com. For more on the telepresence robots, see “Robo Tour Guides Are Ready to Roll at Museums,” Wall Street Journal, October 16, 2015. 15. Miriam Kahn “Heterotopic Dissonance in the Museum Representation of Pacific Island Cultures,” American Anthropologist 97, no. 2 (1995): 324. Ames, M.M.L. Cannibal Tours and Glass Boxes: The Anthropology of Museums. Vancouver: University of British Columbia Press, 1995. Cole, Douglas. Captured Heritage: The Scramble for Northwest Coast Artifacts. Seattle: University of Washington Press. 1985. Clifford, J. Returns: Becoming Indigenous in the 21st century. Cambridge, MA: Harvard University Press, 2013. Brown, A.K., and L. Peers. Museums and Source Communities: A Routledge Reader. London: Rout- ledge, 2005. Edwards, Elizabeth, Chris Gosden, and Ruth Phillips. Sensible Objects: Colonialism, Museums and Material Culture. Oxford: Berg, 2006. Geismar, Haidy, and Jane Anderson, eds. The Routledge Companion to Cultural Property. London: Routledge, forthcoming. Henare, A. Museums, Anthropology and Imperial Exchange. Cambridge: Cambridge University Press, 2009. Herle, Anita. “The Life-Histories of Objects: Collections of the Cambridge Anthropological Expedition to the Torres Strait.” In Cambridge and the Torres Strait: Centenary Essays on the 1898 Anthropological Expedition, edited by A. Herle and S. Rouse, 77–105. Cambridge: Cambridge Univer- sity Press, 1998. Jonaitis, Aldona, and Aaron Glass. The Totem Pole: An Intercultural History. Seattle: University of Washington Press, 2010. Karp, Ivan, and Fred Wilson. “Constructing the Spectacle of Culture in Museums.” In Thinking About Exhibitions, edited by Bruce W. Ferguson, Reesa Greenberg and Sandy Nairne, 61–77. Lon- don: Routledge, 1996. Schildkrout, E. “Art as Evidence: A Brief History of the American Museum of Natural History African Collection.” In Art/Artifact: African Art in Anthropology Collections, edited by Arthur Coleman Danto, 153–160. New York: Center for African Art, 1989. Thomas, Nicholas. The Return of Curiosity: What Museums Are Good for in the Twenty-First Century. London: Reaktion Books, 2016. Susan Harding is retired from teaching at the University of California, Santa Cruz. Her most recent book is The Book of Jerry Falwell: Fundamentalist Narrative and Politics (Princeton University Press). She is currently working on a book exploring secular worlds in 20th-century America through the prism of a 1960s NSF/Harvard University anthropology curriculum about the Netsilik Eskimo (Inuit) for fifth graders. Emily Martin teaches anthropology at New York University. She is the author most recently of Bipolar Expeditions: Mania and Depression in American Culture (Princeton University Press). She is currently working on a historical ethnography of experimental psychology in the context of early anthropological expeditions that laid the groundwork for ethnographic methods. This entry was posted in Selected Print and tagged anthopology, applied anthropology, colonialism, Museum.